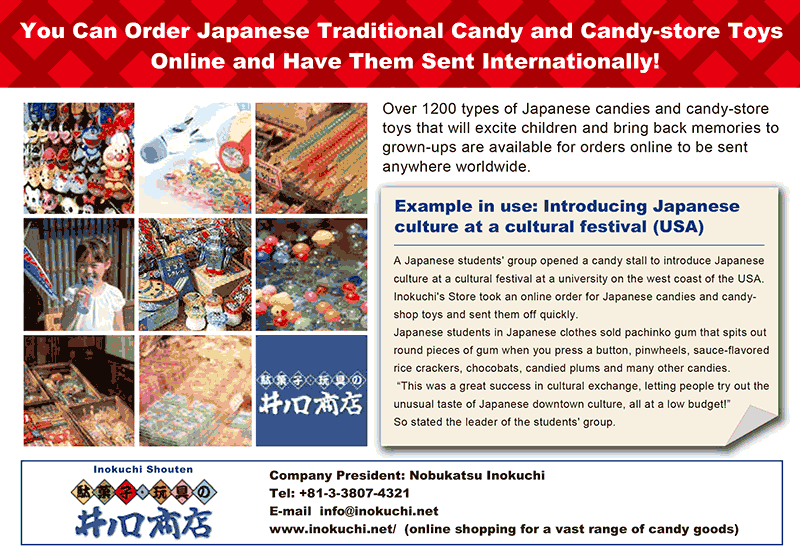 presents:Affordable sweets and Traditional Japanese Toys. We are so happy to show you our goods.We would like to introduce you Japanese toys: cheep sweets which we call “DAGASHI”, balloons,fireworks,partygoods, small gifts and so on.Those items will enrich your stay in Japan, we hope. Those goods make your life much more enjoyable and your events more successful. It is also possible for us to offer you with wholesale price for we are wholesaler. With your advices, we will try to find toys of your needs. Please drop few lines of inquiry at any time. We hope that you enjoy discovering Japanese toys within our homepage. We will be looking forward to your inquiry, comments and advices. You are always welcome to our company. But please have an appointment before you come. If you need to talk in English, you can call the number ０９０－６５３１－８７２９. however, fax or e-Mail is preferred. We thank you very much. Copyright (c)Inokuchi Corporation Allrights reserved.